The Turn Counter is a compact, double sided counter that can help you keep track of up to 32 game turns. Six Initiative Order tokens help players keep track of who has initiative each turn. 35 Victory Tokens come in 1, 5 and 10 point VP denominations. Very helpful when players score points from Story events. 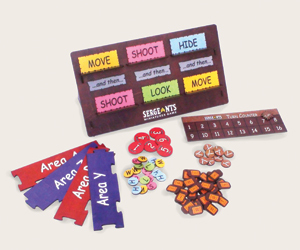 80 Action counters for MOVE, SHOOT, LOOK and HIDE. Keep track of your actions when the battle heats up during play by placing markers by each soldier. 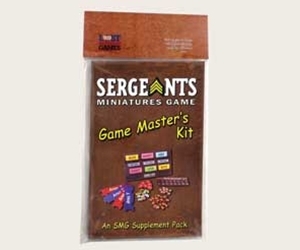 16 Encounter markers help you keep track of enemies your troops encounter for Skirmish orders. Place markers on Soldier Cards to keep track who's been encountered. The Entry Area borders fit exactly as your existing map border pieces. Match them up to the scenario map layout for easy to recognize entry and exit areas. Extra 5 inch and 10 inch border pieces are included for more map building flexibility.